Galerie Durand-Ruel, Paris (no. 1812), by whom acquired from the artist on 8 September 1886. Galerie Durand-Ruel, New York (no. 1004), by whom acquired from the above on 22 December 1892. F. Daulte, Alfred Sisley, Catalogue raisonné de l'oeuvre peint, Lausanne, 1959, no. 572 (illustrated). New York, Galerie Durand-Ruel, Alfred Sisley centennial, 1840-1940, October 1939, no. 13. Toledo, Toledo Museum of Art, Paintings of the French Countryside, October - November 1945, no. 29. Palm Beach, The Society of Four Arts, January - March 1946. Paris, Galerie Durand-Ruel, Exposition Alfred Sisley, May - September 1957, no. 55. Bern, Kunstmuseum, Alfred Sisley, February - April 1958, no. 61. Paris, Galerie Durand-Ruel, Exposition Sisley, February - March 1971, no. 44. '[Sisley] was indefatigable in his exploration of the Loing, wide and shallow as it passed under the old bridge at Moret, deepening and curving as, joined first by the canal du Loing and, almost immediately afterwards, by the energetic stream of the Orvanne, it flowed towards Saint-Mammès and out into the Seine' (R. Shone, Sisley, London, 1992, p. 144). The present work, is part of an extended series of views of Saint-Mammès, painted by Sisley from 1881-1889. 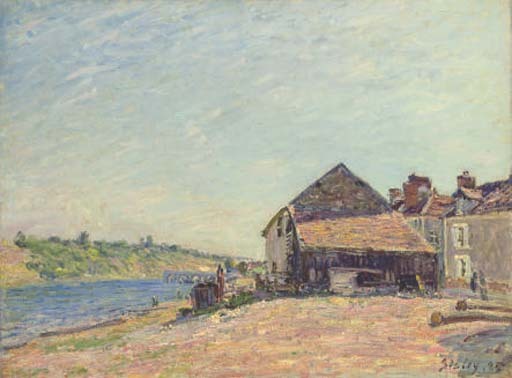 In some of these canvases Sisley depicts an almost deserted, forgotton expanse of river, shimmering under a hot afternoon sky but in others he prefers to paint sites where there is human activity such as the chandlers, supply shops, inns and cafes and boat-yards for construction and repair that are to be found on the banks of the river at Saint-Mammès. Sisley employed a more robust technique for many of these pictures than he had previously used. The hot afternoon sun is suggested by the use of saturated primary colours, which has led some art historians to suggest that Sisley was at least partially aware of the developments of the Neo-Impressionists.